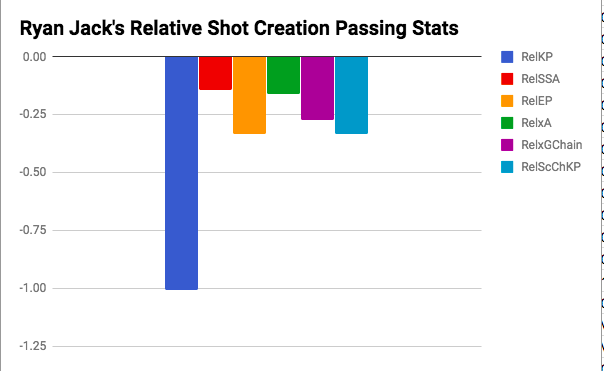 In part one of this series, I used Relative Shot Creation Passing stats to determine who the best (& worst) playmakers in the Scottish Premiership have been this season. In that first post, I focused on the midfielders & wingers who were making the decisive Key Pass that was leading to quality chances. Players like Scott Allan, Stuart Armstrong, Ali Crawford, Chris Cadden & Daniel Candeias were all tagged as being the among the real game changers in the league this season. But being a playmaker goes beyond making the Key Pass. Often it can be the passes prior to that primary pass that can be the key play in the passing network leading to a shot. For example, I think it’s safe to say that this Alfredo Morelos goal from earlier in the season doesn’t happen without the play of Candeias, who makes the Secondary Shot Assist in this sequence. Now, think of this play when reading Arsene Wenger discuss one of his player’s ability to get what he labeled ‘pre-assists’ – the passes that ultimately lead to actual assists. From Max Jones’ 2015 interview for Arsenal’s official website: “[It is] important to get the ball into situations where you can be dangerous. Candeias didn’t get credit for an assist on Morelos’ goal, but it was his playmaking ability & vision that let Tavernier get into a dangerous area to make the short cross over to Morelos. What if Morelos sent that header into the crowd? Does that devalue what Candeias did on the play? That’s why it would be shortsighted to only account for plays that lead to goals. Josh Windass has 17 Secondary Shot Assists this season & none of them have led to a goal. Does that mean Marvin Bartley is a better playmaker since one of his six Secondary Shot Assists ultimately led to a goal? The purpose of this post will be to highlight which players have been among the best playmakers in the league based on their assumed ability to get their teammates into the space in which they can make that Key Pass that leads to a shot. Also, I’ll share who has the lowest output on these kinds of Shot Creation Passes to see what we can learn. Like last time, I’ll use relative stats to see which players are outperforming their teammates in a similar role. The reasons were explained in more detail in the first post, but basically it’s a whole lot easier to set up shots…both in quantity & quality, for a team like Celtic, or even Rangers, then it is for clubs like Partick Thistle or Dundee. Note: I used 500 minutes as the minimum for each leaderboard. More on Rogic later, but that rate is insanely good. He generates 1.47 more Secondary Shot Assists then the average output of the rest of the Celtic midfield. To give some context, notice there are two other Celtic players in the top ten here. He has 26 Secondary Shot Assists this season….Partick Thistle (as a team) has 59. McGinn, Walker, Crawford, Allan, Candeias & Bigirimana are all names that showed up in the previous post & each of them (besides Candeias) were names I recommended that Rangers should have on a shortlist of players to inquire further about. Jamie Walker has been a name linked to Rangers in the past & will be again in January (if another team doesn’t sign him first). His stock is the lowest it has been in a while with his contract expiring this summer & given his recent struggles to get consistent minutes for Hearts. His goal scoring is down, but the data suggests he is still an effective playmaker. Yes, I know he tends to drag his play into a more central role…but I’d be fine with that on Rangers – especially given a). Declan John’s ability to drive possession into the final third up the left flank (that seems like a good fit to Walker’s tendencies) & b). Rangers desperately need some central playmaking from midfield. Blair Alston makes his debut on one of these lists as he has become one of the key players in St Johnstone’s attack this season. The former Falkirk youth player also sees his contract expire this summer. Should the 25-year old be a target for Rangers? Probably not….but he should be on the shortlist of just about any other Scottish Premiership team. It’s been particularly satisfying seeing David Templeton’s success this season & quite frankly, I was surprised to see him so high on this list. I wonder if the fact that he leads Hamilton with 2.95 shots per 90 is impacting how defenses are playing him. If a defender is closing down Templeton because of the threat of a shot, maybe that’s opening up space for him to find a teammate in open space. Just a theory that could be an angle that a performance analyst could answer better. Now…the midfielders & wingers with the lowest Relative Secondary Shot Assists per 90 minutes. Bet you were surprised to see two Celtic players in the bottom five here. Before you charge up any ‘mean tweets’, realize that both Forrest & Sinclair were highlighted (in a good way) in the previous post. Forrest was in the top ten for Relative Key Passes, while Sinclair was in top 15 for both Relative Expected Assists & Relative Scoring Chance Key Passes. Sinclair is one of the most dangerous playmakers in the league, while Forrest isn’t that far behind. But notice what this data has been telling us. Celtic have a distinct passing network. Tom Rogic & Callum McGregor play the ball to the likes of Sinclair & Forrest to set up shots. Interestingly, Rogic’s Relative Key Passes per 90 is -0.35, while McGregor’s is +0.00. Meanwhile, Armstrong is basically leading the league in every Relative Shot Creation Passing stats category known to mankind. But, if you exclude him & just look at the aforementioned trends of Rogic, McGregor, Forrest & Sinclair — something can be learned on how to defend Celtic in the defensive third. The next tier of Shot Creation Passes I track is Establishing Passes (which is a fancy name for the third shot assist). In isolation, this stat can be a throw away, but it’s the outliers who are proving their consistent value in the build-up play leading to shots who deserve some attention. Often, it’s simply cycling the ball to the right player to make a play & other times it is a pass that can change the tempo of the play. There are various incarnations of this pass & there are also certain players who are steadily involved right before the play opens up. There can be insight in coincidence sometimes. Take Jason Holt’s Establishing Pass below. Spoiler: Holt leads the league in Relative Establishing Passes per 90 & in this example, Holt’s decisive forward pass changed the tempo of the attack & ultimately triggered the progression of the ball that ultimately got to Morelos on the edge of the penalty area. Jason Holt’s output goes beyond coincidence. He has become a key component in Rangers attack as he is consistently been the foundation of a passing sequence that leads to a shot. It’s not flashy, but it’s something that Graham Dorrans was not doing before his injury. Dorrans’ Relative Establishing Passes per 90 was +0.00 (he was the baseline of average). If Jamie Walker departs this January….Hearts already have a replacement in place. Sixteen-year old Harry Cochrane has stepped into Hearts lineup & is already being relied upon to drive the team’s attack. Ummm….Gael Bigirimana made each of the Relative Shot Creation Passing leaderboards for Key Passes, Secondary Shot Assists, & Establishing Passes. That’s a shrewd piece of business for Stephen Robinson to sign Bigirimana this summer. It’s taken him awhile to get steady minutes, but whenever he is on the pitch – the former Rangers midfielder is connecting play in midfield & making the right kinds of decisions that are ultimately leading to shots. The biggest surprise is that Scott Brown is not on this list. His Relative Establishing Passes per 90 is +0.07, so he is still involved at an above average rate compared to the rest of the Celtic midfield. But….Ntcham has had a much more tangible impact on the build-up play when he has been on the pitch. He had among the lowest relative output for Key Passes & Secondary Shot Assists, but this shows that his playmaking actually happens earlier in the play. You give a pass to McGregor & Candeias given that this is not their role. Both are among the leaders in Relative Secondary Shot Assists, while Candeias was included in each of the lists provided in the previous post. Ryan Jack, however…. In the last post, I highlighted Jack’s importance & influence as a defensive midfielder…in the same vein as Marvin Bartley. However, this is a red flag. He is not involved in the build-up play leading to shots….at all. Let’s compare Ryan Jack to someone like Dylan McGeouch. 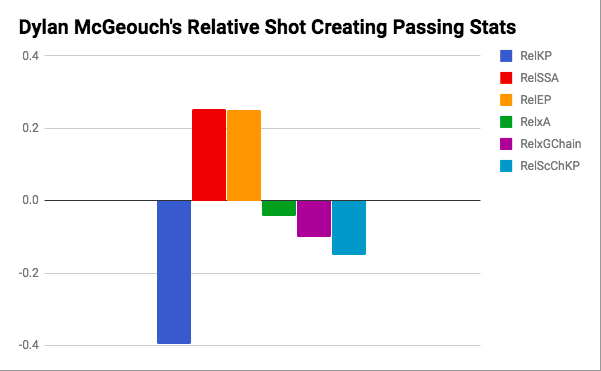 All of Jack’s Relative Shot Creating Passing stats are in the negative…he is less involved then his teammates at each level of the passing network that leads to shots. While McGeouch has a clear role being defined in the stats. His job is to get the ball to the ‘playmakers’, to find McGinn or Barker or Stokes & let them get the ball into a dangerous area. xG Chain uses the Expected Goals value of the shot taken as a means of seeing which players passing is most often leading to dangerous chances. This goes beyond the Expected Assists allocated to the player who makes the Key Pass & applies the same concept to the other passers in the passing network (up to the Establishing Pass…for my own sanity). Now, for the other side of the table. The players who are least often involved in the passing network that leads to quality shots. A list you really don’t want to see one of your players on. Yes….you guessed right. It’s Ryan Jack, again.